« Extraordinary Congregations – A Quick Tour through L.A. Guest Post: Rev. Donna Simon – There Are No Sides in Ferguson. All of us have been affected by the actions in Ferguson, MO these past two and 1/2 weeks. Many of you have posted thoughts on Facebook, tweeted, and have written longer reflections. Last week, Pastor Donna Simon, ELCA pastor and member of Proclaim and Pastor Jennifer Thomas (an ELM Extraordinary Friend!) went to Ferguson as part of a faith-based organizing collaborative called PICO National Network. Donna wrote about her experience on her blog, Peace Pastor, re-posted here with Donna’s permission. August 22, 2014. The situation in Ferguson, Missouri this week is complicated. I read that on Facebook and Twitter and was convinced, though actually going there helped a lot with perspective. There are many competing narratives about Ferguson, and even firsthand accounts vary. Real witness is best done up close, though. We usually see what God is doing in our communities by venturing outside of our church walls and our comfort zones. God is doing a lot of things in Ferguson, and so too are people. People are doing good things, bad things, complicated things. What we do know is this: On August 9, 2014, Michael Brown was shot by a police officer in Ferguson, Missouri. It appears that he was shot six times. He joins an ever-expanding roster of unarmed young black men shot by police officers, and his death exposed a community’s pain over the way it is treated by the police. None of this is open to debate. It’s not a “side.” It is the truth. Mike Brown was unarmed, and he is dead. There is pain. It is being expressed. There was also looting. And “rioting,” which is a word employed to describe a panoply of human behaviors, some of them peaceful and some more detrimental to persons and property. The looting and “rioting,” alongside details released about Brown’s behavior before and during his brief time in police custody have provided a neat opportunity to describe this situation in the language of Western modernism. There are “two sides,” to wit: the lawful side, whose primary symbol is the mostly white law enforcement community, and the side of those who believe that injustices have been perpetrated (and continue to be perpetrated) in Ferguson. Standing for the latter is a much more diverse community which includes Mike Brown, peaceful protestors, “rioters” and looters, national activists, and people who express their displeasure with the situation on social media and other outlets. Every night, police have opened fire on the protesters with tear gas, rubber bullets, and possibly real bullets. Greater St. Mark’s Missionary Baptist Church has been functioning as sanctuary space for the protesters, clergy and activists who are witnessing in Ferguson. The handwritten sign out front says “Safe Space. No alcohol. No guns.” People have used the space for rest and respite, and to wash tear gas out of their eyes. The police learned that the church had been offered as sanctuary, so they began a series of interventions which seem to be aimed at intimidating those inside. They lined their cars right outside of the gymnasium space occupied by protesters. They entered and confiscated items, including some Maalox which was being diluted to treat tear gas injuries. They threatened to remove everyone from the church property. Police have chased protesters, hit them with batons and the butts of rifles, shouted at them, and practiced other forms of intimidation. People who have engaged in a lot of nonviolent civil action have been shocked by the extreme behavior of the police, especially the Ferguson PD (now relieved of duty) and the St. Louis County police. A community is hurting and angry. There are still protesters walking and shouting at the police. Their behavior may not be helpful, but their frustration should be understandable. At least two grassroots organizations have grown out of this continued engagement between protesters and law enforcement. One is called Clergy United; that group is gathering clergy from the St. Louis Metro, and we were told last night that clergy from beyond the Metro are asking how they might become involved. The other group is made up largely of young people. They call themselves the Peacekeepers, and they are doing just that. Both groups have their names on shirts already. They are legit. Young people are raising their voices in Ferguson, in largely constructive and courageous ways. Many were marching peacefully last night, at times chanting, “I’m young. I’m strong. And I’ll keep marching all night long.” Their energy shows no sign of flagging. Clergy are present. I went to Ferguson with my friend and colleague Jennifer Thomas, because we were invited by the PICO National Network, a faith-based community organizing collaborative. Both Jennifer and I are active with PICO and our local affiliate, Communities Creating Opportunity. It was an easy decision. We are called to stand in broken places and offer a word of grace and healing. People are marching because they have to. I mean that they are compelled to do so by frustration, faith, commitment to social justice. Also, they are required to do so by the police. No stopping is allowed. There were a lot of cops. A lot. They were clustered in groups of 5-20. At least a couple dozen clusters. There were armored vehicles. The presentation is very combative and intimidating, which would seem to be the point. So much remains to be done. So many words of healing and hope are still to be uttered. There has been precious little dialogue between law enforcement and community leaders, and the brokenness will continue until that happens in a viable and sustainable manner. This is going to be a long process. It will be a complicated process, and will require a lot of folks to stand down and give up some of their power in order to engage in real conversation. There are no sides. Just brokenness, pain, anger. So God is there also. Rev. 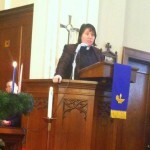 Donna Simon is pastor at St. Mark Hope and Peace Lutheran Church, in the urban core of Kansas City, MO. She is married to Colleen Simon and is a member of Proclaim, an active community of LGBTQ Lutheran rostered leaders, candidates, and seminarians. This entry was posted on Tuesday, August 26th, 2014 at 2:27 pm	and is filed under Blog. You can follow any responses to this entry through the RSS 2.0 feed. Both comments and pings are currently closed. Thank you Donna for sharing your observations and insight. Thank you, Donna, for your thoughtful perspective! Thanks, Donna and Jennifer… for going there. To be a presence. To bear witness. To be a witness. And to tell us of these things.